Time is very short and I need your help. TODAY at noon, Senator Ron Latz is going to be offering up anti-gun Universal Gun Registration and Red Flags Orders amendments on the Senate floor to cram Bloomberg’s agenda down the throat of Minnesota gun owners! Senator Latz’ Universal Background Checks (SF1261) and Red Flags Orders (SF1262) bills are a gross abuse of the Second Amendment and a slap across the face of law-abiding gun owners and if passed would be a disaster for our Second Amendment rights. 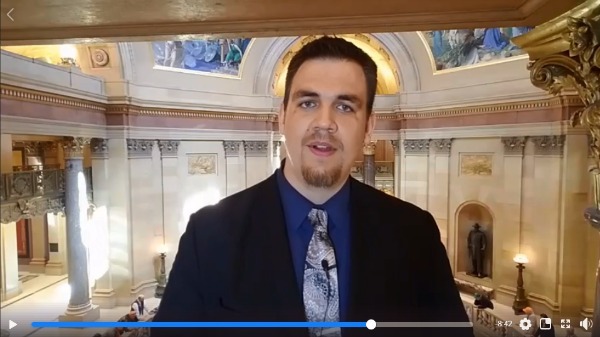 Minnesota Gun Rights staff was fighting at the capitol yesterday as the news broke across the state about this betrayal of gun owners. To watch our live update with all the details of what we’re up against, please click on this link or the image below! Because criminals don’t obey laws, the “extreme risk” and “ex parte” protection orders in SF1262 won’t be worth the paper they’re written on and only serve to strip citizens of their rights without due process. Background checks don’t work, but what they do do is create a massive, federal database of gun owners, and we’re opposed to that in every way, shape and form. And that’s EXACTLY what Ron Latz wants to RAM through the Senate TODAY! So please click on this link to tell Your Senator to Vote NO on ANY Gun-Control on the Senate Floor! Make sure your Senator gets the message that any support, assistance or vote on the Senate floor to further gun-control will be met with severe judgment by gun-owning voters in coming elections. When you’re done, please consider an EMERGENCY contribution to help us flood the capitol with pressure from grassroots gun owners across the state using email, online media, direct mail and (coming very soon) radio ads! I don’t know what you can afford but all I ask is that you be as generous as you can. Whatever you do, please click on this link to our Action Center and send your message IMMEDIATELY telling your Senator to vote NO on any amendments offered by Latz or his cowhores in the Senate.